It's more than just a new hook. It's the origination of a revolutionary new technique made possible by Gamakatsu's industry-changing G Finesse series. Pro Staff, Shinichi Fukae, spent the last year perfecting the concept and proving its power. We've combined our G Finesse Worm Light with Tin Keeper Hook with the G Finesse Swivel Shot System to create the first ever Swivel Shot Worm Hook. Unique in form, function and finesse. Texas Rig the Swivel Shot Worm to be fished in and around cover. The light wire allows for threading extremely small diameter worms, held firmly in place by the near weightless, Tin Keeper. 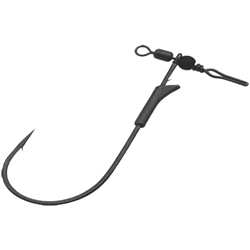 The hook also features our unique Nano Smooth Coat Finish. Adding the "twist-free" advantage of the Swivel Shot allows super fast rigging without tangles. You can be assured the presentation is always perfect, and that translates into more strikes and more bent rods.